It's bad enough getting injured going over the bars but when you get a dog having three goes at your leg it takes a lot of self restraint, something I've not got a lot of, to keep from letting loose a stream of foul and abusive language. In this case the owner was an elderly lady who seemed to get an even bigger shock than I did when her pet whippet sank its teeth into my leg not once but three times just to make sure I got the message! I think in fact I ended up apologising to her because she looked as if she was going to have a heart attack! My first attempt with the self timer on the camera! This is actually the track I should cycle up but the recent heavy rains have burst the banks and made life a bit more difficult here. 21 miles today to keep the mileage moving along, and I went for an anti tetanus jag after I got home, here's hoping the mutt didn't have rabies! It's banana time, and it's needed for what's coming next! This is what's next, the long slog up to West Kip on soft grass and greasy tracks! The River Esk , quite high due to the recent rain. Yesterday was quite unusual, it didn't rain! As this is about as rare in Scotland as peace in the Middle East I took the opportunity to get out twice on the bike, first of all with Dougie in the forenoon, when we did a hard 26 miler and then at night with Mark when we did an equally hard ( for me anyway ) 24 miler. As I write this today the rain's hammering down and the wind's shrieking like a banshee, so back to normal weather then. Good job I got out yesterday it doesn't look like I'll be out today! Clear enough for the first picture after a 6 am start. Some hardy sole must have spent the night in this small tent in sub zero temperatures.......brrrrrrrr! A slight covering of snow near where the tent was pitched, -2 C at this point. The sun just about to rise over West Kip this morning at 8.30 am approx. Clive made an appearance this morning after over a months absence due to a combination (he says) of a heavy cold which turned into a chest infection (or man-flu as its known) and a small as yet untreated hernia in an embarrassing area! Its always good to go out with someone who's struggling a bit on the fitness side as it makes you feel so much better (at least that,s how I feel! ), but he acquitted himself well only complaining on the steep sticky climb to West Kip. The temperature never really rose above zero with a few tricky icy patches here and there and a dusting of snow at about 1500 feet. 26.5 miles today to bring my weekly total up to 125 miles, hopefully the weather will stay reasonable this next week! A 35 mile birthday epic! The start of the route to Glentress, Marks house in Carlops and the temperature was below freezing! The top of what was probably the toughest climb of the day up a soft grassy track, but when we stopped to recover the view over West Linton was spectacular. 1st mishap of the day! I attempted to cross a small river, but failed badly, and my camera and car keys fell in. We managed to fish them out, much to Baz and Marks amusement, me getting my feet soaked during this carry on and remember the temperature was even further below freezing at this point! Needless to say the camera will never take another picture! Marks secret fuel, dried strawberries all the way from Majorca, they let him down badly later on in the ride! 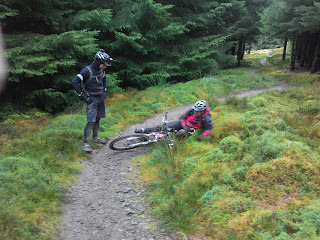 The aforementioned strawberries magic biking properties deserted Mark as we neared the top of the black route at Glentress and he was forced to take a rest, Baz looks on in amusement! A view of my backside as I fix a puncture about 200 yards from the mast at the top of the black route, only one of several mishaps. It was my birthday on Sunday so an epic was on the cards. Baz and I met up with Mark at his house in Carlops at 8am and set off over the hills to Peebles. After about 2.5 hours we reached there and the hard cycle up Janets Brae to the cycle tracks of Glentress. We decided to keep going up the black route and I managed to catch a stone and crack my knee against the banking at one point while Mark did a spectacular over the bars when he skidded on a corner. (Baz , rather boringly had no offs). Before we reached the top of the black Mark was running on empty and literally fell over into the heather at one point! However after a short rest we got going again and eventually got back down to the cafe at the bottom where a £10 that been in the camera case when it fell into the water was still in good enough condition to buy some sustenance before we drove home in Marks landrover which he'd had the foresight to leave the night before (thank god). All in over 35 miles riding and over 4500 feet of climbing enough to ensure a goods nights sleep. The first problem (and probably the main one) is the bloody awful weather, especially this year when dry days have been few and far between. Last night we were due to go out a 6pm for the (more or less) weekly mid week bike ride only to find at 5.30 it was chucking it down as if there was no tomorrow. Mark phoned to say he'd have to come along by boat, not really an option, so he called off. I phoned Dougie and being a similar mountain bike nutter like myself we decided to give it a try. Hells teeth, it turned out a great nights riding with only one short shower near the end. The other main problem is the lack of daylight hours at this time of year but with a good set of lights this can be overcome. So come to think of it, there's nothing really stopping me! What the hell am I complaining about? !